So we have a hole in our ceiling. It's been there since last Thanksgiving. Maybe you read our past post where we talked about water damage in our living room. The water was coming from somewhere in the bathroom, so we made a hole in our ceiling. Hold on - let me back up. Thanksgiving weekend 2017, we noticed the hallway ceiling was wet. Again. First we checked the attic and the roof - no issues there. Then Pat did what anyone else would do and made a giant hole in our ceiling to inspect things. We thought through all the possibilities: the pipes? The sink? The shower? Please - not the toilet. We couldn't figure it out immediately. So we left the hole in the ceiling. We knew we would figure out the mystery eventually. After I took a shower later that same day, water was dripping from our new ceiling hole. We had our answer. Pat ripped another hole - this time through the tile in our shower - and found the material behind it was crumbling, damp, and moldy. In case you are not sure, let me clarify: this is not good. The material was (and is) so deteriorated that we aren't sure if it's cement board or drywall. But whatever is going on back there, the damage is certainly done. With the damage assessed, we then debated our two options: fixing just the shower, or redoing the entire bathroom. We weren't planning to tackle the bathroom for a few more years, and therefore we're budgeting for it. But using our resources to fix a shower that we might overhaul again in a few years sounded like a waste. In the end (clearly - because here we are! 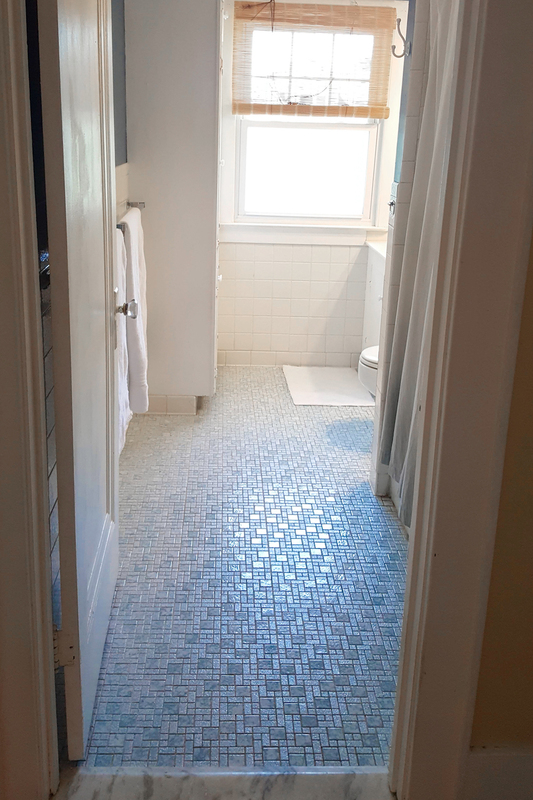 ), we decided to move up our full bathroom renovation timeline. We start with the shower next weekend, but the whole project will probably take a while. Before we start working, I thought I would show you where we're starting. Some context: this is our only full bathroom. We have a half bathroom on the first floor. Almost everything you see here (with the exception of mats, towels, and soap dishes) is from when we moved in. The current vanity. We need to refill our hand soap dispenser. The shower curtain is from Urban Outfitters and badly sun-bleached. But check out that broken switch plate! And I think the placement of this switch is a code violation. The view from the hallway, which is still painted yellow (GAHHH). We do love the marble threshold, though, and we are keeping it! You can probably understand why we went for the full remodel. I don't think this bathroom has been touched since the 1980s. That's one of the major drawbacks of buying a house that's had such high turnover in ownership. 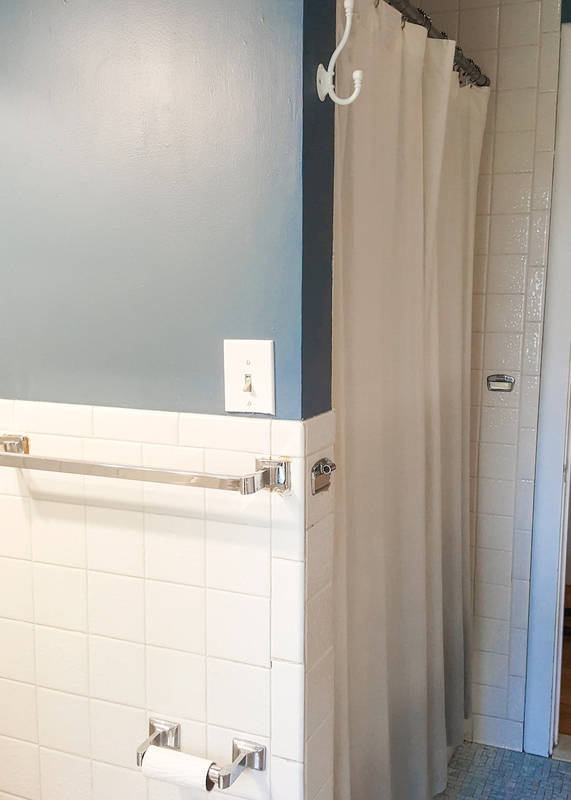 If you were only going to be in a house for a couple years, would you invest in a completely updated bathroom? I wouldn't, so I don't blame them. But we're hoping to break that cycle. This house deserves better. We are doing the remodel ourselves, along with our dads who were always bound to pitch in. We're still putting together a list of products and doing some purchasing, but we start next week! Anyway, that's all for now. I have a mood board and inspiration list I'd like to share with you. We are also trying to stick to a budget and a plan, but we've already had to pivot a few times from our original ideas. I'll get into that in another post. In the meantime, I'm curious to know what you think! What bathroom designs, features, or trends are you loving at the moment? 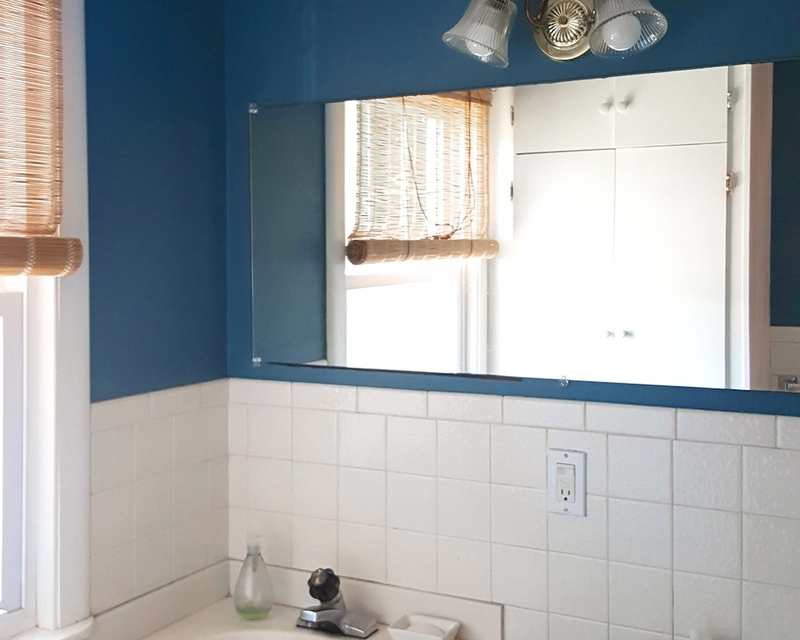 Or maybe you've been through a DIY bathroom remodel. Do you have any advice for us? Please share them with me in the comments, we would love to hear!